David Moyes is not sure just where the Didier Ndong “rollercoaster” is positioned at the moment – but he is sure Sunderland have got a good midfielder. The 22-year-old became the club’s record signing when the Black Cats shelled out £13.6 million to Lorient on transfer deadline day. While the French club undoubtedly inflated the fee for the Gabon international, in the light of the colossal TV deal for Premier League clubs, it meant there was always going to be pressure on his young shoulders. It would also be fair to say that the midfielder Sunderland fans had been hoping to see was the return of Yann M’Vila, who had starred on-loan during their Premier League survival battle. The feeling was mutual it seems and the Frenchman was “heartbroken” when the Wearsiders could not agree a deal with Rubin Kazan. It meant the 26-year-old remained with the Russian club with Ndong landing at the Stadium of Light as Moyes’s major summer signing. After making a decent start, there have been encouraging periods from the athletic midfielder, though there have also been lapses which have either cost goals or almost cost goals. But Moyes believes the promise is there. “Didier is just beginning to settle in a bit more,” said the manager. “It is not easy to come in, especially in the position we are in. “I think he is finding his feet. I thought he started very well then had a dip. “He did a bit better at Bournemouth. Expectation levels over Ndong had been raised after being described as “the new Michael Essien”. 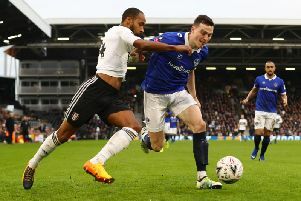 He was beginning to look the part with Lee Cattermole and Jan Kirchhoff for company in the middle though their absence over the past month has not aided his cause. Not only has he had to get accustomed to the ways of the Premier League, the French-speaker has also had to get to grips with the language barrier. “I think his understanding is getting better,” explained Moyes. However, Moyes says that the fact he is full of youthful energy, enthusiasm and talent will, ultimately, make him a successful signing. “He is young, that is the thing,” he added.